Check out their websites to see what they have been working on lately! Check out the article to see this inspired photo shoot based on the styling of “It ” woman Amelia Earhart. Using vintage inspired elements of china and chargers, lace and velvet mixed with contemporary and masculine feeling flatware and some pretty awesome living jewellery we created a vision worthy of an amazing strong woman! I had the pleasure of chatting with Michelle Brisebois at Canadian Florist Magazine back in December about the upcoming release of the 2017 Pantone Colours of the year. Well, the article just came out and apparently I had something “quotable” to say about it! There is a fun and inspiring floral event is shaping up at Mayfair Mall next week! It is called Fleurs de Villes. This flower extravaganza coordinates local florist with corporate sponsors. We are creating fashion with flowers! Come and check it out between April 20-24 and be sure to vote for your favourite design! Wedding Bouquets! Canada’s Most Beautiful Ones! Wedding Bells Magazine has just released the ” Most Beautiful Wedding Bouquets of 2015″ and we were so pleased to be a part of it! I had so much fun creating this beautiful garden bouquet for them! It includes so many of my favourites: garden roses, sweet peas, ranunculus, lilac, smoke bush, ivy berry, succulents, pansies, calla, leucadendron and even kalanchoe! Check out the article here to see what florists all over Canada are creating to inspire your wedding dreams this year! 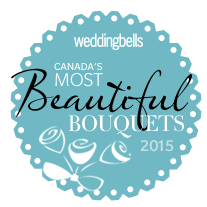 Canada’s Most Beautiful Bouquets 2015 : Foxgloves Flowers 2015 Creation. 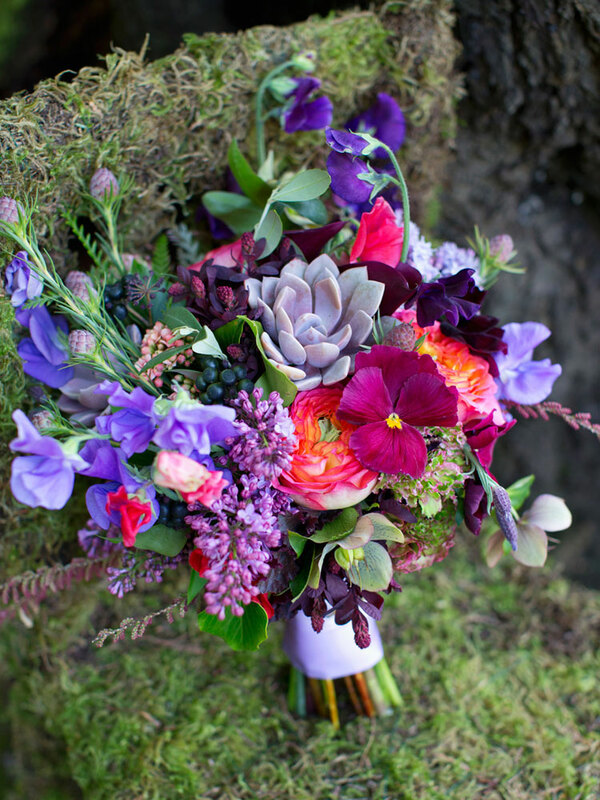 A Magical Garden creation of pansies, sweet peas, lilac and succulents and garden roses. 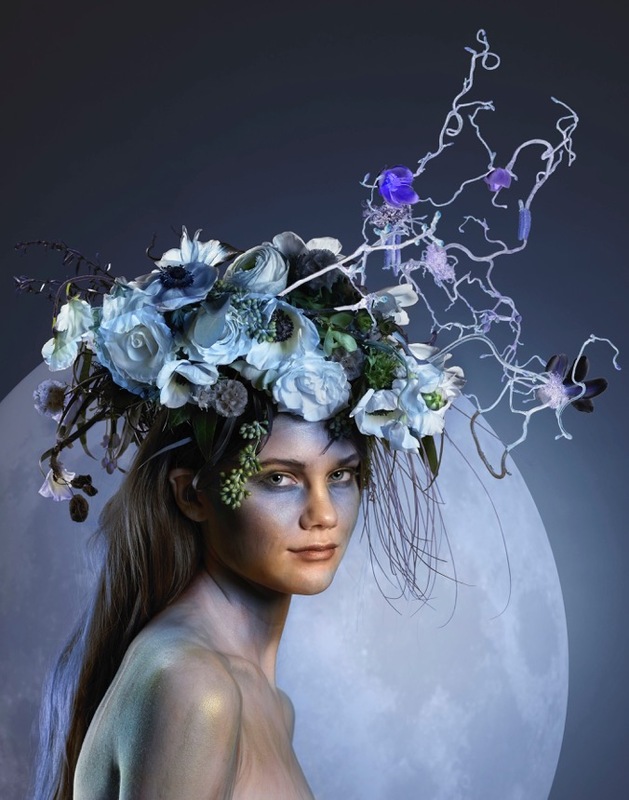 I had the awesome pleasure of creating this crazy dramatic head wreath for the photo shoot with Jo-Ann Richards at worksphotpgraphy.ca for the advertising campaign for the Pacific Operas production of A Midsummer Night’s Dream. What a fun project!